Most commonly used on aluminum storefront doors including franchise stores with employee turnover, this all mechanical lock is suitable for a variety of applications such as boats, RV’s, gates, safes, drawers, liquor/medicine cabinets and lockers. Another new Digital Door Lock by Lockey Systems! The M210 was so successful, Lockey decided to also make a slightly smaller, more compact slide bar lock, that is similar to the 2200 series. Where can you use this keyless lock? Virtually on any hinged door, including wood, metal, glass, aluminum store doors, cabinets, and any swinging door where you need a surface mount. (M220 is perfect for doors that are not thick enough to accommodate a 1 1/4" wide conventional deadbolt) With this combination lock, business owners and managers never again have to pay a locksmith to re-key their lock when an employee leaves... you simply change the combination yourself in just minutes. 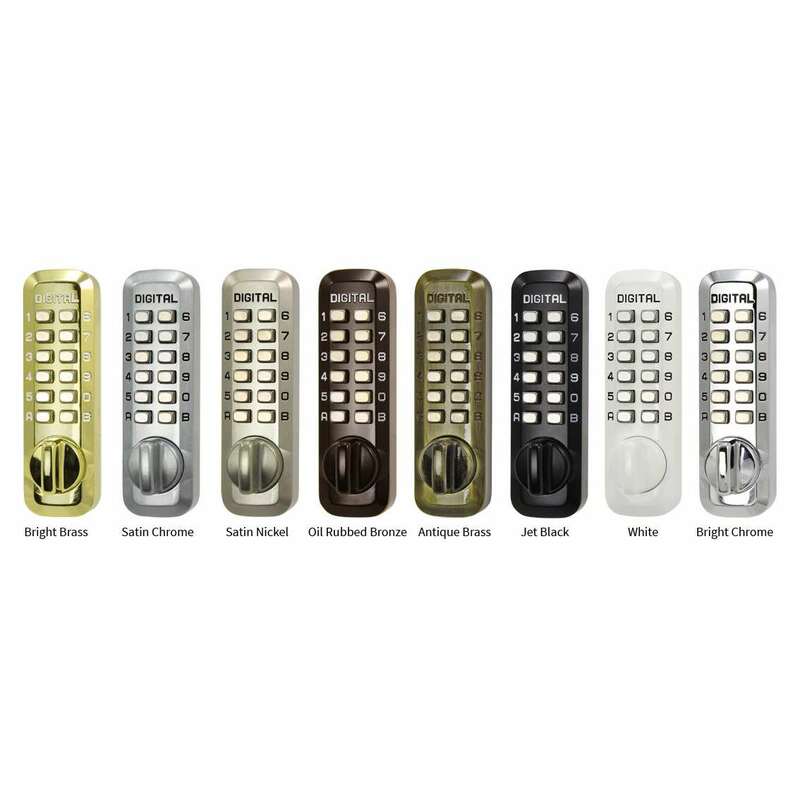 The M220 Digital door lock is so compact and stylish, it is also an excellent choice for homes, apartments, and condos where it can be used to secure entry doors, liquor cabinets, medicine cabinets, gun cabinets, pool gates, garden gates, safes, and even refrigerator doors. Parents with small children will find this lock superior in keeping kids out of harms way. 1 7/16 (W) x 4 7/8 (H) x 1 3/4 (D) in. 5 5/8 (H) x 2 1/2 (W) x 1 7/8 (D) in. Installed two of these. One on each of the gates into our backyard. We’ve had them in place for several months and they have worked great. No complaints. We used it on a gate to the backyard. Only downside was that I would have preferred a longer bar which locks it. Directions for installation were good and we have had not problems for 6 months. Received very promptly, and was exactly what we ordered. perfect. My home was recently entered by someone who had a key and they stole MAC computer. We feel we know who is was, but can’t prove it. The MAC was close to the entrance of the home and that’s all that was taken. I have a computer room with a lot of equipment and nothing was touched there. I purchased your M220 lock for the door of that room, the M220 works fine, they may get in that room, but they will have trouble doing it. Thanks for providing some security in my home. I am now looking for a remote dead bolt which I think you can supply. Yes, it can be used in that manner as long as the doors close tightly together without much of a gap. 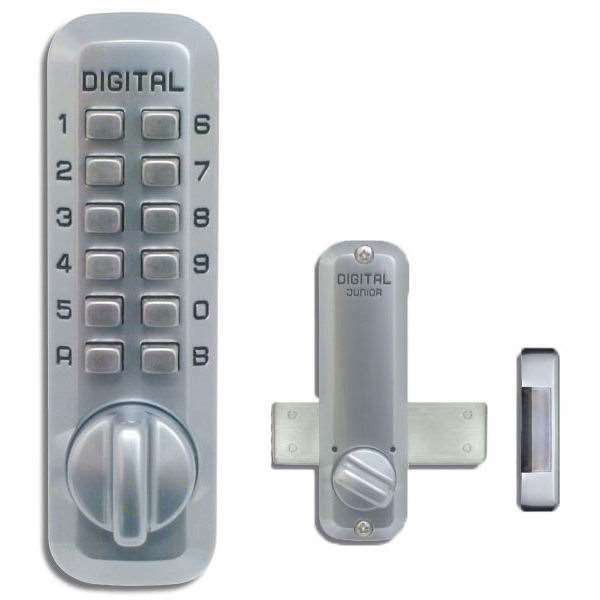 Answered by the admin The Lockey M220 is a mechanical deadbolt lock. This means there are no batteries and uses push pins for its coded entry. When a valid code is entered you then turn the knob to throw the deadbolt and then must turn the deadbolt again to lock it. There is no automatic throwing feature in this lock. You can find the template and installation manual here at Lockey USA.